I have been representing tenants across the US and overseas for 34 years. As I write this narrative, I want to provide value, spot trends and get business. If you have a question or need office space, call me. We would love to work with you. 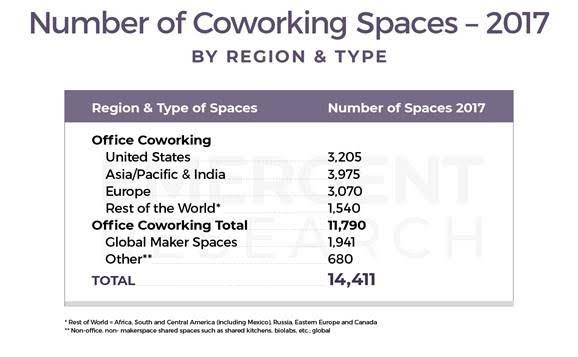 One huge trend that has had a meteoric rise this cycle is collaborative workspace. Staples came out with a cool study on millennials (click here to see the whole study) and at the end, they have a short section on collaborative workspaces. Like the iPhone, this is a category that did not even exist 10 years ago and now they are everywhere. WeWork, the industry leader, is now valued at $21 Billion. No typo - BILLION. When I wrote about this start up in 2015 they were overvalued (IMHO) at $5 Billion (read that narrative here). Well the cycle continues and they, along with other knockoffs, category killers and specially groups, are still adding more to the market. Below are two graphs showing the size of the market and how this type of working environment has altered work style. While the growth has slowed, the change is here, affecting office space and office space users and changing the market. –In the next recession, we will really see if this type of space will endure and have a gut check on the size of the market. –The market is always changing. Don’t be a dinosaur. –Planting a flag in a new market has never been easier, cheaper, faster, and more efficient. –Temporary space for growing companies is available now.